dident something like this happen in Control+alt+delete? or is this somehow different? I can't say I'm excited. so they have in-store kiosks that you can use to purchase games, that you then have to go home and wait for it to download?? Are reward points worth the effort of going out to the shop, instead of just buying it from your couch? And store openings slowing? OH NOEZ! THERE REALLY ISN'T SUCH A THING AS UNLIMITED GROWTH! sigh...this seems like a good thing though, a step in the right direction. So basically they are making a retailer/arcade hybrid? I have to say that it's a bold step and it might work in some limited capacity, but I would like to see it in action before making a final judgement. I still don't get why I'd go to a gamestop to buy a downloadable game, considering the closest one to me is about a 30 minute drive away (lots of EB stores still). ... Not seeing how this is innovative. Why would I leave my house to buy digital copies of video games? I'm a little off-balance by how much this doesn't hook me. I can't imagine anything short of "Free Copies of Planescape: Torment Tuesdays" getting me to show up. Sounds like a clever plan; basically making a one stop shop for all things gaming, downloads included. It's a gamble, but hell, I've heard of stupider ideas in the realm of modern gaming. I fail to see what makes it different than buying say. Game + points card. I can see all kinds of issues from informed parents. What do you mean I have to hook up my xbox to the internet. Technology scares me. I bought it in store I should have it here. 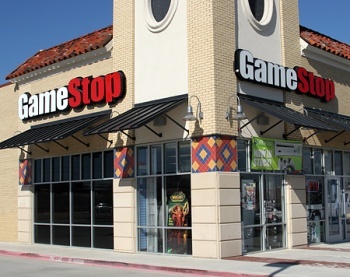 Meh, I'd rather hear about GameStops closing. They are the Activision of retail.